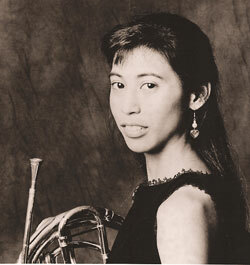 Canadian horn player Michiko Singh joined the Honolulu Symphony in 2000. As well as being a private horn instructor, Ms. Singh performs with various groups around the islands such as the Royal Hawai’ian Band and was recently appointed Principal Horn of the Maui Symphony. Ms. Singh previously held titled positions in orchestras all over the world including the Hong Kong Philharmonic, Vancouver, Memphis, and Hartford Symphony Orchestras. She has performed with the New York Philharmonic, the New World Symphony in Miami, the Colorado Music Festival Orchestra, the Royal Winnipeg Ballet Orchestra, the Canadian Broadcasting Corporation Orchestra, and in the Arkansas, Nashville, and Canton Symphonies. From Carnegie hall crowds to Rusti the Orangutan, Ms. Singh has played for diverse audiences, including those at the Pacific Music Festival and Kyoto Chamber Music Festival in Japan, Music By the Red Sea Festival in Israel, The Aspen Music Festival, Round Top Music Festival, Music Academy of the West, and the Banff and Brott Festivals in Canada. Ms. Singh was a finalist at the Metropolitan Opera auditions for Fourth Horn. Described as “skilled” by the New York Times, Ms. Singh’s versatility takes her outside orchestral realms. After studying chamber music at the Sarasota Chamber Music Festival, Ms. Singh became a member of the Amphion Winds, winners of the Artist International Competition. As a soloist, she won First prize at the 2003 Solo Horn Competition at the International Women’s Brass Conference. She also won the Canadian Imperial Bank of Commerce National Brass Competition and the General Motors Solo Competition. She was awarded the Jr. Arts and Letters Award from the Canadian Club of New York. Ms. Singh’s major teachers were New York Philharmonic members Jerome Ashby and Ranier DeIntinis. She also studied with John Cerminaro, Dave Krehbiel, and Froydis Ree Werkre. A recipient of two prestigious Canada Council Grants, Ms. Singh was a scholarship student at the famous Juilliard School in New York City where she received her bachelor’s and master’s degrees in Music Performance. She is currently Hawai’i’s representative for the International Horn Society.